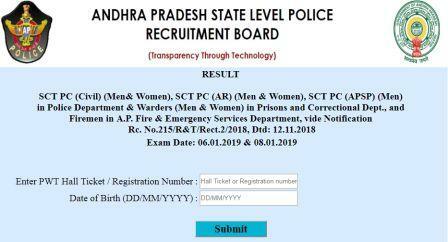 Andhra Pradesh State Level Police Recruitment Board(APSLPRB) has released the results of the exam held for the police constable post. The exam was held for the posts of SCT Police Constables(Civil) , SCT Police Constables(AR) , SCT Police Constables (APSP) in Police Department and Warders (Men), Warders (Women) in Prisons and Correctional Services Department and Firemen in A.P. Fire & Emergency Services Department. పునర్‌మూల్యాంకనం కోసం పోలీస్‌ రిక్రూట్‌మెంట్‌ వెబ్‌సైట్‌లో 24 జనవరి ఉదయం 11 గంటల నుంచి ఈనెల 25వ తేదీ సాయంత్రం 5గంటల వరకు దరఖాస్తు చేసుకునే అవకాశం కల్పించినట్టు చెప్పారు.